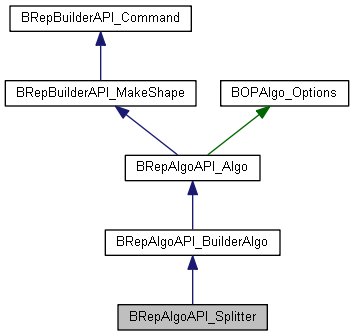 The class contains API level of the Splitter algorithm, which allows splitting a group of arbitrary shapes by the other group of arbitrary shapes. Tools - shapes by which the Objects will be split. The result of the operation contains only the split parts of the shapes from the group of Objects. The split parts of the shapes from the group of Tools are excluded from the result. The shapes can be split by the other shapes from the same group (in case these shapes are interfering). There is no requirement on the existence of the Tools shapes. And if there are no Tools shapes, the result of the splitting operation will be equivalent to the General Fuse result. BOPAlgo_AlertBuilderFailed - in case the Building of the result has failed. Constructor with already prepared intersection tool - PaveFiller. Performs the Split operation. Performs the intersection of the argument shapes (both objects and tools) and splits objects by the tools. Tool arguments of the operation.